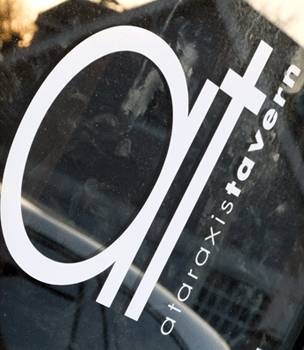 Edit 12/29/10: We are sorry to report that Ataraxis Tavern has closed it’s doors. 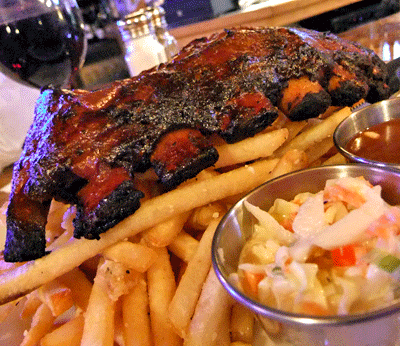 Marblehead’s got a new bar and grill in town, though you likely haven’t heard of it yet. Ataraxis Tavern has quickly and quietly filled the space left by Flynnie’s and in the month since their soft opening, has been generating great buzz. Jeff Flynn and his family are well regarded by Marbleheaders and both Flynnie’s on the Avenue and at Devereux Beach were favorites of many, so while it may not be fair, comparisons by locals will be inevitable. On first glance, the interior feels darker, warmer and indeed quieter for such a small space. The paneling on the walls, which was originally reclaimed wood from a tannery in Peabody, has been stained a dark walnut. The other big change is the black tablecloths and linen napkins at each table. Dean explains that not only does this help in baffling noise, but using linens is also more cost effective and creates less waste than paper. The new chairs and fresh coat of paint add to the revived atmosphere. And families with children shouldn’t be put off by the new look—our junior Dish member was delighted at the offer of an Etch-A-Sketch from the stash at the hostess stand to occupy kids waiting on their food. There are a couple of changes that haven’t happened yet, but are in the works. The floor needs refinishing, but instead of fighting the salt, sand and snow of winter, that will wait till warmer months. Also, the custom painted glass between the restaurant area and bar is in the process of being replaced. Much of the transformation, Santamaria-Capetanelis tells us, will never be seen by the public. The kitchen has gotten a facelift, as well as new chef (Riccardi) and sous-chef (Jake Soucy), and a new computer system installed. There are some familiar faces, though, because he hired back the former Flynnie’s wait and bar staff which made the transition smoother than most. The menu, as promised, centers on hearty and comfort food favorites. The big difference here is that everything is prepared to order from scratch, using fresh ingredients. Dean already uses local suppliers like Patriot Lobster for seafood and Atomic Café for coffee, and is interested in locally sourcing as much as he can as the seasons change. While we didn’t get to explore much of the menu, we did try the ribs ($14.50 for half rack, $21 for full) which were terrific. They were fall-off-the-bone tender and had great flavor. The grilled farmhouse burger ($8.75) was fresh, juicy and generous, and the fries plentiful and tasty. Santamaria-Capetanelis is pleased with the initial public reaction, and said that business for February, (a difficult month to open anything) exceeded their expectations. Visitors have warmed to the new place, and with so many storefronts still vacant from economic upheaval, we’re thinking Atlantic Avenue can only benefit from the energy generated by Dean and his crew. If you are interested in checking out the AT for yourself, think about heading over tomorrow night, Thursday March 4th, for their grand opening celebration. They will be serving up samples of their signature dishes as well as handing out fun freebies from Cape Ann Brewing Company from 5-7 pm. On our recent trip to Newburyport to visit the farmer’s market, we decided to stop at Port Tavern for a late lunch. 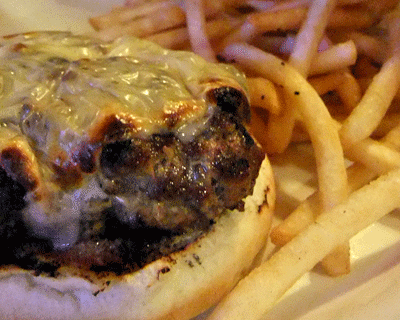 This is just our kind of place—lots of comfort food selections, an excellent burger, and a comfortable atmosphere. Our visit was marred by poor service, but we’ll assume that’s not the norm, as others in the restaurant appeared well tended to. We thoroughly enjoyed the fish and chips ($13), which had a generous portion of fish and steak fries that were crisp on the outside and creamy inside. We also liked the shepard’s pie ($12), which had robust beef flavor and a creamy potato topping. The aforementioned burger ($9) was juicy and had great charred flavor, a good bun, and fresh lettuce/tomato on the side. Sandwich orders come with a choice of 10 sides, including garlic mashed potatoes and onion rings. We went with the baked potato, but it came completely plain, which was odd. (We weren’t asked about toppings when we ordered, and none came on the side). We also ordered the white truffle mac and cheese, which turned out to be gemelli in a terrific, cheesy/earthy sauce. But the parmesan breadcrumb crust on the menu description somehow turned into a few crushed crackers sprinkled on top. We liked the fact that diners are given lots of choices, including those sides (which you can order on their own for $3) and four types of bread for panini sandwiches like the grilled chicken and pear ($8). We didn’t like paying $2.50 for coffee or waiting more than 45 minutes for our food. We’re guessing our waitress forgot to put in our order since nearby diners received their food in reasonable time and she ignored us the entire time we waited, refusing to meet our hungry gazes. All that was needed was an apology and a basket of bread, but neither were forthcoming.